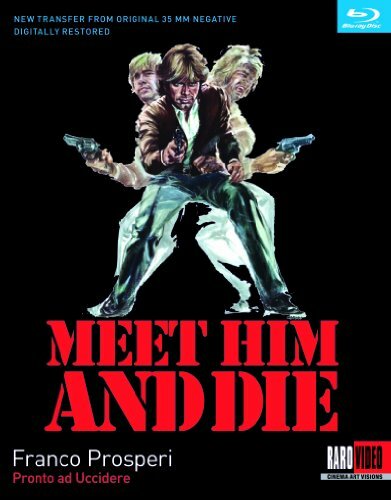 NEW YORK, NY- MARCH 3, 2014 - Raro Video is proud to announce the Blu-ray and DVD release of Franco Prosperi's Meet Him and Die , a rare gem of the poliziotteschi genre starring Ray Lovelock (Fiddler on the Roof; Live Like a Cop, Die Like a Man), Elke Sommer (Lisa and the Devil, A Shot in the Dark), and Martin Balsam (Psycho, Cape Fear). Stefano and Gianluca Curti started Raro Video Italy in 1999. Dedicated to digital restoration of films from a wide range of genres, bypassing any stylistic boundaries, the company has earned an outstanding reputation for the quality of its high-definition transfers. Its releases are also known for their supplemental content as well as the critical analysis and superb booklets that accompany each film. The firm opened its U.S. headquarters in Minneapolis, Minnesota in 2010. Raro Video U.S. is a subsidiary of Gruppo editoriale Minerva/Raro, which is owned by Minerva Pictures, a 50-year old production and distribution company that continues to make films and boasts a catalog of more than 1,000 films. Directors featured in the Raro Video catalog include: Federico Fellini, Michelangelo Antonioni, Pier Paolo Pasolini, Luchino Visconti, Roberto Rossellini, David Lynch, Derek Jarman, Shinya Tsukamoto, Rainer Werner Fassbinder, Jean-Luc Godard, Werner Herzog, Lars von Trier, Lucio Fulci, Mario Bava, Francesco Barilli, Tinto Brass, Jean Cocteau, Pedro Almodovar, Martin Scorsese and more. Available now from Raro Video U.S.: The Vanquished, The Clowns, The Anger, Live Like A Cop, Die Like A Man, Body Puzzle, The Visitor, Come Have Coffee With Us, The Overcoat, Murder Obsession, The Secret of Dorian Gray, Crime of Love, Young, Violent, Dangerous, Steam - The Turkish Bath, The Night of the Devils, Madness, The Automobile, To Be Twenty, Conversation Piece, The Perfume of the Lady in Black, Plot of Fear, Waves of Lust, Ubaldo Terzani Horror Show, The Fernando Di Leo Crime Collection Vol. 1, The Fernando Di Leo Crime Collection Vol. 2, Shoot First, Die Later, Hanging for Django, Il Generale Della Rovere, and Nightmare City.